There are many things to like about an educational conference like NCTE. Sure, the collaboration and sense of community, and shared knowledge and expertise is all wonderful. 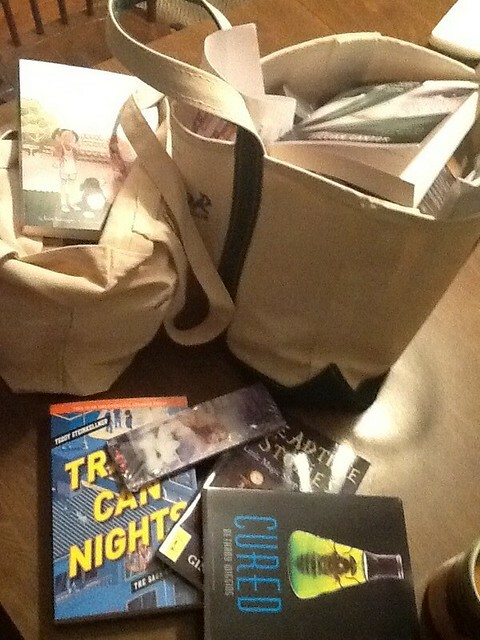 But there is also … the free books that publishers hand out in the Exhibition Hall, and this year, my wife and I took home many, many bags of free books (we drove this year so we just kept dragging bags to the car). Plus, we got a few bookmark packs, tattoes, and even a “graphic story” builder pack. My students will love perusing the pile. This entry was posted in books, NCTE. Bookmark the permalink.